These reports are prepared in this order and are issued to the public as a full set of statements. This means they are not only published together, but they are also designed and intended to be read and used together. Since each statement only gives information about specific aspects of a company’s financial position, it is important that these reports are used together. For instance, the balance sheet shows the debt levels of the company, but it can’t show what the debt coverage costs. Both the balance sheet and the income statement are needed to calculate the debt coverage ratio for investors and creditors to see a true picture of the debt burden of a company. The purpose of these reports is to provide useful financial information to users outside of the company. In essence, these reports complete the fundamental purpose of financial accounting by providing information that is helpful in the financial decision-making process. Understanding these business financial statements is the first critical step investors, creditors, and you can take to learning about a company’s earnings, profitability, asset management, financial leverage, cash flow, and current shareholders’ stake. Once you understand all of these aspects of a company, you can gauge its relative financial health and determine whether it is worth investing in or loaning money to. Companies issue different types of business financial statements for a variety of reasons at a variety of times during the year. Public companies are required to issue audited financial statements to the public at least every quarter. These regulated reports must meet SEC and PCAOB guidelines and often must be reported in a consolidated fashion. Non-public or private companies generally issue financial sheets to banks and other creditors for financing purposes. Many creditors will not agree to loan funds unless a company can prove that it is financially sound enough to make its future debt payments. Both public and private companies issue at least 4 financial statements to attract new investors and raise funding for expansions. Financial sheets that are issued for time periods smaller than one year are called interim statements because they are used as temporary statements to judge a company’s financial position until the full annual statements are issued. Interim financial statements are most commonly issued quarterly or semi-annually, but it is not uncommon for companies to issue monthly reports to creditors as part of their loan covenants. Quarterly statements, as the name implies, are issued every quarter and only include financial data from that three-month span of time. Likewise, semi-annual statements include data from a six-month span of time. Since these interim statements cover a smaller time period, they also track less financial history. This is why annual financial statements are generally more reliable and better represent a company’s true financial position. The annual financial statement form is prepared once a year and cover a 12-month period of financial performance. Generally, these statements are issued at the end of a company’s fiscal year instead of a calendar year. A company with a June year-end would issue annual statements in July or August; where as, a company with a December year-end would issue statements in January or February. Public companies are required by the SEC and the PCAOB to issue both interim and annual statements. A CPA firm must always audit annual statements, but some interim statements can simply be reviewed by a qualified firm. Who Uses Financial Statements and What Are They Used For? Investors and creditors analyze this set of statements to base their financial decisions on. They also look at extra financial reports like financial statement notes and the management discussion. The income statement and balance sheet accounts are compared with each other to see how efficiently a company is using its assets to generate profits. Company debt and equity levels can also be examined to determine whether companies are properly funding operations and expansions. Most investors and creditors use financial ratios to analyze these comparisons. There is almost no limit to the amount of ratios that can be combined for analysis purposes. These ratios by themselves rarely give outside users and decision makers enough information to judge whether or not a company is fiscally sound, however. Investors and creditors generally compare different companies’ ratios to develop an industry standard or benchmark to judge company performance. 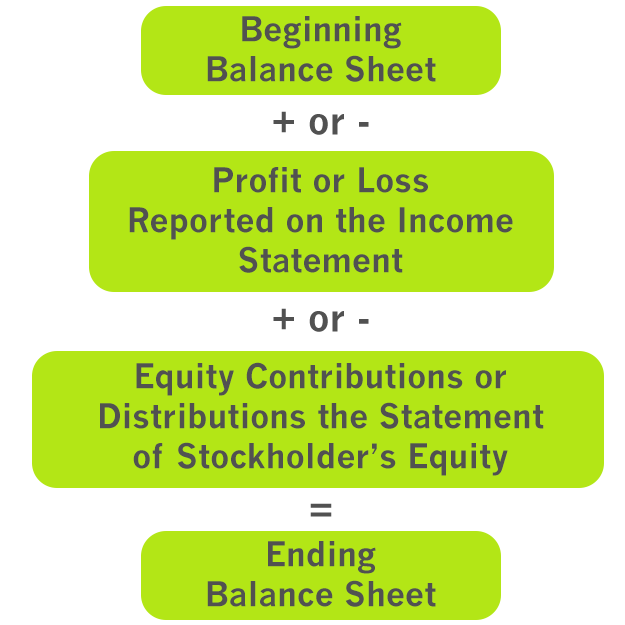 Here’s a sample financial statement template that shows the order of how each statement works together to report the full economic position of a company beginning with the balance sheet. As you can see, everything starts with the prior period’s balance sheet. This is the starting point for all of the reports because it shows the asset, liability, and equity accounts at the beginning of the period. From this starting point, we can add or subtract the operating activities reported on the income statement. This includes all revenues and expenses that the company incurred during the year. We also need to add or subtract the amount of money investors put contributed or withdrew from the company during the year. This information is reported on the statement of stockholder’s equity for corporations or the statement of partner’s equity for partnerships. Once all the operating, financing, and investing activities are added to the beginning balance sheet, investors, creditors, and management can analyze the ending balance sheet and see how well the company performed during the period. Here are the main financial sheets that are prepared by most companies. These examples should answer the question, “what is a financial statement?” We’ll also talk about some extra styles of statements and other reports that are commonly issued. Here’s the list of the most popular ones. 1 What are Financial Statements? 2 Who Issues Financial Statements? 4.1 Who Uses Financial Statements and What Are They Used For?